In 2007, we stepped out into the brilliance of the next generation morning. Eyes adjusted, 2008 came into focus, the blinding radiance replaced by clarity and sumptuous details. Although the hype may have peaked last year, the games themselves clearly did not. 5.) Grand Theft Auto IV - Strangely enough, I think GTA IV's legacy will suffer from the praise heaped upon it by game reviewers. So unanimous and hyperbolic were the great reviews for this game that when the millions of us who bought it actually sat down and played, we couldn't help but be a little underwhelmed. It's far from a perfect game, but the city, guns and music are all there. And that alone makes GTA IV intriguing enough to deserve a serious second look, maybe not tomorrow, but certainly in the coming year. I might feel the same way I did in April of '08, but it is a rare game that compels me to take another peek. 4.) Sins of a Solar Empire - When people think of PC gaming, titles like Sins of a Solar Empire come to mind. By that I mean it has expansive tech trees, hours and hours of commitment and no real single player campaign. Sins of a Solar Empire somehow managed to combine the PC's two most obtuse genres, the 4X strategy game and the RTS, into a fairly coherent experience. Sins of Solar Empire's other miracle was to make its running requirements as modest as the space battles are epic. The game isn't for everyone, but at least almost everyone can find that out for themselves. By this I mean log out of Spore, download Sins of a Solar Empire and give it a try. You might be surprised at yourself 4 hours and two space wars later. 3.) Boom Blox - The Wii promised many things in 2006, but two years later, it seems to deliver on those promises only occasionally and rarely as a cohesive experience. Boom Blox is a pleasant exception to that rule. A puzzle game at heart, Boom Blox lets players smash blocks with balls or pull them out in complicated variations of Jenga. It's a game that's intuitive from the outset thanks to incredible Wiimote execution and great physics. While the concept is modest, its perfect execution allows it to stand among the best Wii games I've played this year. 2.) LittleBigPlanet - For me, LittleBigPlanet's great feat is making the act of play feel casual again. Sackboys travel from club house to club house as they play through levels with each other, slapping and emoting merrily on the way. The game creates the feeling of exploring something new with your friends. Each level is a new adventure, a new path through the woods in your backyard. The seriousness of memorizing maps is gone as is the anger at people logging off for dinner. Media Molecule took a serious look at how children play and, through LittleBigPlanet, reminds us what it feels like. 1.) 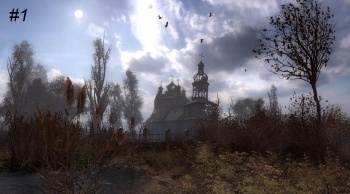 Stalker: Clear Sky - This is my favorite game of 2008. Simply put, the game creates an enormously compelling world. Through GSC Gameworld's amazing work with light, environmental effects and AI, the world of Stalker: Clear Sky emerges as one that is far more dynamic and alive than either of those sandbox headliners, GTA IV and Fallout 3, that also saw release in '08. Perhaps this game's audience is too small to allow anyone to sensibly call it a game of the year. After all it is a sequel, it's extremely difficult and few will have access to a computer that can run the game the way it deserves to be seen. But, small audiences aside, seeing a developer confront a piece of its country's recent history in such an original and affecting manner makes Stalker: Clear Sky my most remarkable gaming experience of 2008. Come back tomorrow for John Funk's five picks of the year. In case you missed any of our Fave Fives, check out the full list.